We are offering this beautiful mountain retreat with it's fantastic views of the Golf of Nicoya and the Pacific Ocean , with a comfortable climate, pasture lands and numerous fruits trees, coffee trees, and house. The house was completed in 2009, here are some of the amenities. Central on-demand hot water, up to date electric, "city" water, telephone service. Master bedroom with attached large bathroom which is shared by the large guest room. Three additional guest rooms and a second bath room. A large living room/dinning room, large kitchen with adjoining breakfast and laundry room. A storage room, an outside pila (outdoor sink) under roof are at the rear of the house complete the floor plan. Across the front and one side of the house there is a integrated porch and car port. Fully ceramic tile throughout the home. Ceiling fans, high ceilings, aluminum sliding windows with screens. Custom made wood doors. The construction is of concrete filled block with steel re-bar, steel trusses and roof. Doors are custom made of beautiful local hard woods. 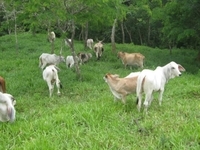 The farm has fenced pasture lands, spring water, coffee trees, fruit trees, corral, and even an old house. There is also the possibility of GOLD ore on the property! 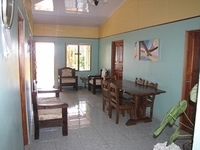 The property in located on a paved road, and even the local bus will stop for you. For investors, the opportunity to sub-divide and sell lots certainly is available. New survey is up-to-date and recorded.